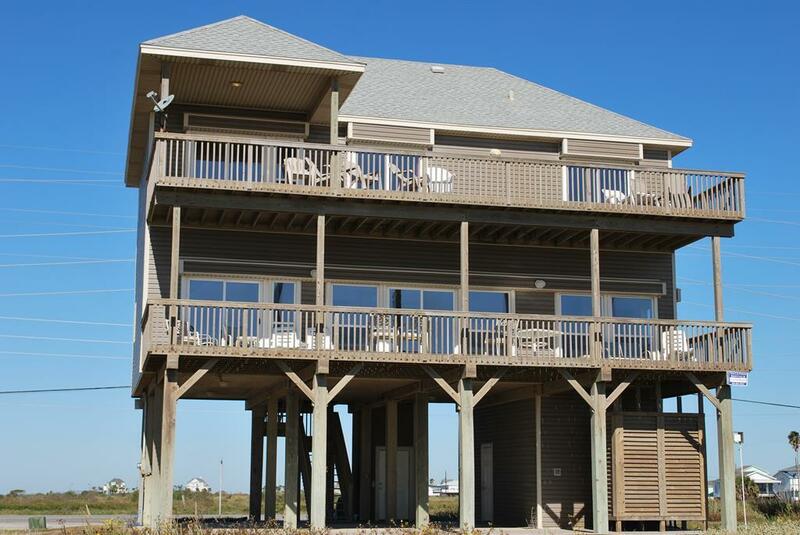 2 decks, beachfront Gulf views from all 4 bedrooms, an elevator, 3 king suites & quick beach access! This beachfront vacation rental is ideal for multiple generations. 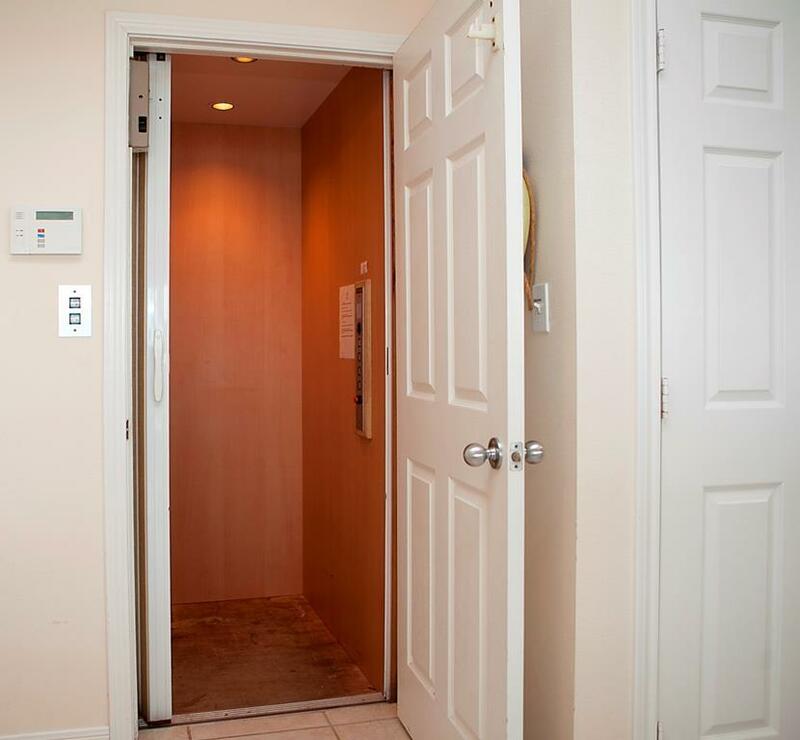 The elevator makes it easy to get groceries, luggage, strollers and more to all levels and every bedroom has stunning water views and deck access! The open floor plan boasts comfortable seating & a large flat-screen TV that is perfect for movie night. When you're ready to get some sand between your toes, the beach is just a few feet away! NOTES: For medical reasons, this house has a strict "No Pets" policy – no exceptions. Great location! Home lay-out is very nice. We really enjoyed our stay at Tropical Waters (this was our 2nd time staying there). This is an annual retreat for us ladies, all in our early 60's, and our main requirement in renting a house is having a cargo lift for all of our luggage and supplies! It makes moving in and out so much easier and convenient! 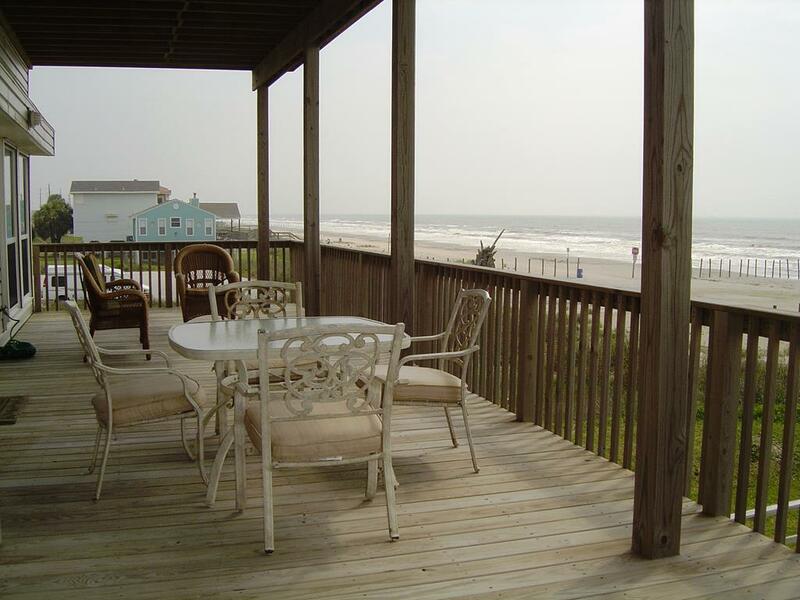 The house was perfect for our stay - comfortable furnishings and excellent view of the beach and water. Our only complaint was that the Direct TV only had local channels - we could not even pick up the music channel or basic cable stations.... this did hamper our music selections since we mostly stay indoors and play dominoes and like to listen to music from the cable channels. Finally on our 3rd day, we figured out how we could get Netflix and watch movies (none of us brought dvd's this time since usually we can pick up movies off of cable channels). They need to update their info binder inside the house that said they had sports packages and HBO - as they did not. Everything else was perfect for us and we would stay there again in the future and probably will. This is a great house and we love the elevator to carry our suitcases and groceries up. We will definitely stay here again. We stayed here last year and booked this house again this year. This our second time staying at this property, and I would stay here again. Great, spacious house on calm, clean stretch of beach. Perfect for a few restful days with the family! Sand N Sea is one of the best there is at rental and support of guests. They are very professional, friendly, and interested in guest comfort and ease. Tropical Waters rental house was the perfect house for my family, all four bedrooms have a wonderful view of the ocean, And all the rooms had automatic shutters that would close during the day allowing for the babies to have a really good nap. All the rooms also had access to the balconies and the elevator made it very easy for my mother to be able to go from the first floor all the way to the third. I love this property very very much . Five starts are not enough! We fell in love with Tropical Waters! The ocean views (from every room in the house) were breathtaking! We were out the door and on the beach in minutes - it could not have been any more convenient. We also commented on how it felt like our own little private piece of beach - many times we were the only ones there. The house was equipped with everything we needed to live and cook just like we would at home. It was extremely clean and everyone said their bed was comfortable! We loved that we could lower the shutters to the bedrooms at night and raise them up in the morning. And, the air conditioners kept the whole house cool and comfortable!The shower outside was so wonderful to have to rinse off after some time in the sand, along with the large picnic table and grill. And, if you have kiddos, there are TONS of great beach toys in the ground floor storage room. You will want to check those out! We made so many wonderful memories at Tropical Waters! We cannot wait to go back and stay at this house! Tropical Waters quickly felt like a home away from home! It's comfortable, well-maintained and in a great location. While a little farther out, it was no problem to head in to Galveston for sight-seeing, shopping or dinner out. The upside to being farther out is the feeling that you have the beach pretty much to yourself. The most awesome aspect of this house are the views - You can see the beach from every room in this house! The elevator is an added plus, making unloading and loading back up a breeze. We wouldn't hesitate to rent this home again. This is a great beach house. This is our second year to stay here. It has a beautiful view and sits on the beach. Perfect for 2 families. The main reason we originally stayed here was because it has an elevator. This allowed my 83 year old mother in law to go with us on vacation. She came with us again this year. We especially liked the outside shower with hot water to wash off after swimming. It was really a bonus. Beautiful living area, had 3 rooms with King size beds and the other room sleeps 4 adults comfortably. Only one restroom on top floor and this does present a little problem. Has the elevator which is super with the elderly. This was our second stay at this house and we will be back. Tropical Waters was an excellent beach house for our family reunion! Right on the water and clean and well equipped kitchen and tastefully decorated! We LOVED Tropical Waters!! It was perfect for our annual family vacation to Galveston. The beach was gorgeous, there were plenty of deck chairs (loved the rockers), lots of beach toys, boogie boards, 3 grills, and kids beach toys provided. The kitchen area was the best for our group for meals and also game night. There were also plenty of large pots/pans/bowls for preparing meals. The elevator was a huge plus for the 3 seniors in our group. We had 4 generations with us, and will be back next year. Thank you so much for this wonderful property! The house was a perfect match to our families.It was spacious and the view was beautiful. We are already planning our next trip to this house. The only complaint (and not really one)is there were no spices at all (we did bring our own) and no small bottles of dish or dish washing soap. I think all beach houses/condos have always furnished this. Excellent for family vacation. Space for three couples and totsl of six children. Tropical Waters is a great house. All of the bedrooms were spacious and comfortable. Lots of TVs and WiFi. Plenty of dining space and a very well stocked all-electric kitchen. There were 7 of us and we were all very comfortable and had plenty of space. Great decks and AC. I couldn't figure out how to operate the shower at first but my son showed me so all was well. People were always using the public beach access nextdoor but that was okay. There were never very many people on "our" beach. It was great having the elevator and outside grills. Be sure and check out the carport closet full of beach goodies..chairs, floats, etc. I would definitely rent this house again. Perfect home for our ladies annual trip to the beach!! We are very selective in choosing the right home for us directly on the beach and found that this home was perfect for us and we will be trying to rent it again next year! Having the elevator for bringing in our luggage and groceries, and moving back out, was the perfect amenity ever for us ladies in our latter 50's! (no more huffing and pulling up and down the stairs with heavy ice chests, etc.). The home itself was perfect for us as well. Great views from every room, great deck with lots of seating, quick and easy access for taking our walks on the beach, nicely decorated inside every room and loved the 8 person seating at the dining table for our many games of dominoes - and with a great view as well! Our only suggestion to make the house absolutely perfect for us would have been to have more seating in the living area around the tv and coffee table (seating for 6 now) - would be perfect with seating for 8 like having a sectional sofa or another chair (we did fine with just pulling a chair from the bedroom though). The main deck had lots of chairs for us to sit and enjoy the view while outdoors; however, we would have loved a larger patio table for playing our dominoes and dining outdoors if it had seated 6 or 8, rather than 4. But overall, this is a wonderful rental home, perfect for enjoying and relaxing day and night! We will rent again if possible!!! Loved the private beach, the walkover to the beach, and all the chairs for seating on the decks! The elevator was great for loading and unloading. Great space for a large group. Great property,lots of room,and right on the beach! This was our second time to rent Tropical Waters. We love the house, however this year there was not enough patio furniture on either deck. Last year there were 4 or 5 really nice lounge chairs that were not there this year...please bring them back!! The shower heads in both of the master baths are clogged and need replacing. other than these issues, we love the house...it's the perfect size for our family and we love the elevator for loading and unloading! Hello Poye family! We definitely appreciate your feedback about the outdoor furniture and have shared your comments with the homeowner. Our maintenance manager will be addressing the shower heads - thank you for your feedback! We absolutely loved Tropical Waters! The layout of the home was perfect for our group. The kitchen was well stocked with pots, pans, etc. The fact that the home had an elevator made unloading and loading SO much easier. Our only comments is that there were no chairs on the upstairs deck, which we would have enjoyed using. We know now to possibly bring our own chairs next year when we rent as this deck would have been very enjoyable. 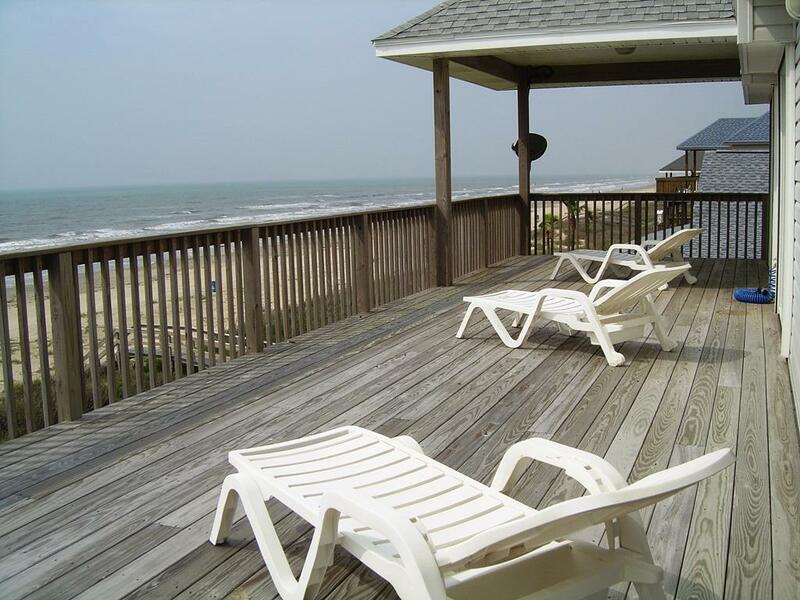 We really enjoy the covered deck and the beachfront view. Excellent beach front property with beautiful views of Gulf. Elevator in home a plus for big family gathering. Would definitely rent this property again. Great house, quiet location. The beach was wonderful until the seaweed washed ashore then it was a pain to get to the water. I loved how the kitchen was well stocked. There was a few things I would fix like the peeling paint on the cabinets and the rusted out dishwasher. The patio furniture needs to be replaced and the carpet cleaned. Other than that I would rent this house again because of the nice floor plan, the elevator and the great view of the ocean. We liked the the fact that there was 3 king beds and the shutters on the windows. I would choose this house again despite the things mentioned above but if that was all fixed....it would be awesome. Hi Maria! Thank you for the great feedback! Our maintenance manager will be working with the homeowner regarding the items you mentioned. We look forward to seeing you again soon! property was wonderful, very clean , lot of room and beach was great. Wonderful property right on the beach. The proximity to the beach for our young grandchildren. The view from the house overlooking the water was awesome. The decks were large for gatherings and for the kid's to play. My stepdaughter wanted to rent the property when her father comes to Houston in June but the property was booked. 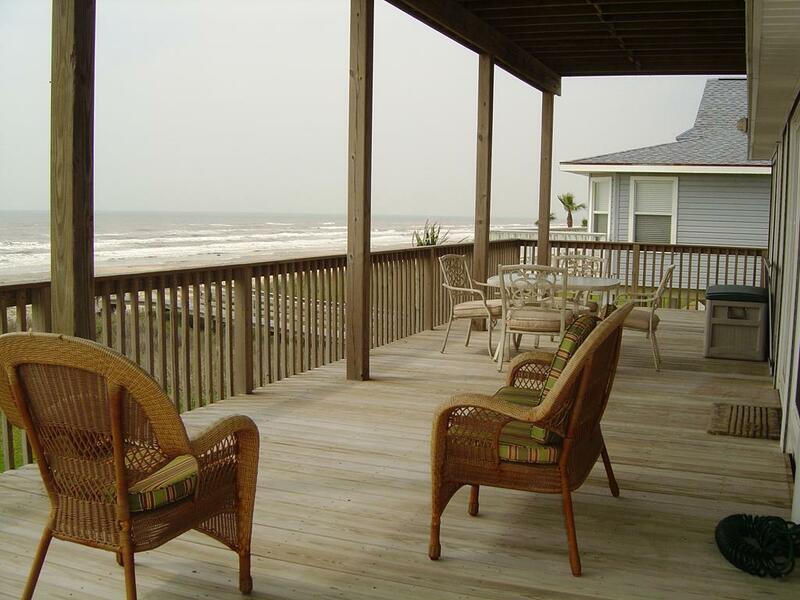 We will definitely rent the home again when we vacation in Galveston. Perfect place to gather and socialize with friends. The room with bunk beds is spacious. The comfort of the beds in the bunk room was not good, but that is what usually comes with a room full of bunk beds. We expected to not be comfortable in that room. If you rent this room and don't have kids put the younger couple in there. The best feature of this lovely home is the large master just off the living area and the elevator. My 89 year old father could be right in the middle of everything and still feel like he could come and go whenever necessary. We loved the spacious kitchen and beautiful view. Great property. Elevator is a plus. Only took two trips to get everything in. Living room furniture is not as shown on website. Sofa has been replaced with outdoor furniture which is not as comfortable. Bedrooms were very nice. Electric shades were a real plus. Walkway to beach needs to be completed. Older folks in our party had difficulty getting down and up the walkway. Great property for kids. Overall we really enjoyed this property and will probably rent again in the future. this was our first time at Tropical Waters (stayed at No Agenda the last two years)It's the exact same floor plan as No Agenda which we like but with an elevator. LOVE the elevator! I have a difficult time with stairs so this was fab!! Now, some cons...the comfy looking floral couch & chair shown in the living room pic have been replaced with an awful "patio" furniture like couch which was even uncomfortable for the kids much less the older folk!! The sliding door to the deck was extremely hard to open & probably should be replaced (I'd suggest a French door)We do love the beachfront location & Sand n Sea has always been wonderful to work with! We would rent this house again if they would change out the living room furniture. All the other furniture was fine. We are happy to report that as of 04/17/14 updated living room furniture has been added to Tropical Waters! There are now a comfortably upholstered couch, love seat, and chair - as pictured on the house page! We have rented from Sand and Sea for years and this is our favorite house! With a few minor improvements, it would be perfect: Ants...lots of ants! The sliding glass door of the main living area is very difficult to open and close; needs better and more pillows in all upstairs bedrooms; the futon mattress upstairs is too thin to sleep on..it really needs to be replaced. Otherwise, we absolutely loved it. Hello Poye Family! We are glad you enjoyed Tropical Waters! We are sorry that you encountered ants during your stay. Each of our homes receives regular pest control maintenance visits, but sometimes there can still be "uninvited guests". Unfortunately, ants are being reported as a county-wide problem right now. We look forward to seeing you again next year! Very comfortable homelike beachfront home. We had a great time! Every room had a ocean view and deck access. The location is wonderful, close enough to entertainment in town yet distant enough so that we felt we had nearly a private beach. We loved this home! It was spacious with an awesome floor plan and view of the Ocean! The beach was clean and the water was refreshing! We returned home to SNOW! This is a roomy, comfortable house in a great location on the beach. The layout of the rooms is perfect for groups that include children or separate couples/families. This house was wonderful. We have people not able to use stairs. The elevator was perfect. The view and the beach was great. . We are already picking a date to go back. This is a very quiet area without many other homes that will use the same beach. The veiws and breezes are great! We just spent 3 nights at Tropical Waters and loved it! Three families with 2 children each fit comfortably in this house. The kids loved that they could all stay together in one room and each adult couple had a king room and their own bathroom. The setup was perfect for our needs! Wish they would have had a grill though. Hello Franz Family! We are glad you enjoyed Tropical Waters! We are sorry that there wasn't a grill at the home during your stay - sometimes they are "borrowed" by other people and not returned. We would have been happy to bring one to you - next time be sure to call the office and we will take care of you! Great property. We stayed with four toddlers. This was our second stay in this property. It's a great layout for adult friends with a handful of children. We were four adult sets with two kids (one of the 'adult sets' slept in the bunk room with the kids). The built-in in the living area has toys for younger children, and the decorative shelves in the dining area have playing cards. The master suite on the main level was pretty quiet, even when folks were talking in the living area. Comfy couches, a large table for eating/game playing, and lots of deck furniture make this unit one that we'll probably rent again. As of Oct. 2011, the house needs some minor maintenance, but is otherwise in great repair. We were very pleased with the house. The kitchen was furnished with amenities beyond what we expected. Though Miramar Beach is further down than we initially wanted, it was a bonus as the beach was not crowded. The view was fantastic. We would rent this property again. fourth year to rent "Tropical Water's" and would rent again. Very nice home and very comfortable, nice place for a family vacation. This house is fantastic. EVERY bedroom has a sliding glass door with balcony access and of course a view of the ocean. The dining table & area accommodated 8-9 adults, plus there was additional seating at the bar. The furniture was incredibly comfortable. It is definitely farther west than most beaches, but that was a plus for us because there were not hoards of individuals driving in each morning and hanging out in front of the house. When you walked downstairs you could walk straight onto the beach. I highly recommend this house and have already recommended it to a friend. You just can't relax any more than hearing the constant rush of the crashing waves right outside your doors. My only wish is that there would have been deck furniture on the upstairs balcony, but there was definitely enough to accommodate us on the first floor balcony. Lastly, Sand N Sea was incredibly helpful with great staff. Thanks for facilitating our fabulous weekend.